Turn the cold water on while the disposal is running – Running cold water while your disposal is on will prevent grease and other things from hardening and getting stuck on the gears. If you allow grease to build up, over time your disposal will become clogged. Run your garbage disposal on a regular basis – If you constantly put things down the disposal and then forget about them, they can cause it to become clogged. The gears, blades and other mechanisms can also rust if they aren’t used regularly. Clean your garbage disposal with dish soap and citrus peelings – Garbage disposals can become dirty fairly easily, since bacteria-laden food wastes are put down them. Clean your garbage disposal by pouring in a little soapy water and grinding up citrus peelings. Put animal bones, grease or rice down your garbage disposal – Grease will clog the disposal and prevent it from running properly, while animal bones are too hard for the disposal’s blades. Both of these things can damage a garbage disposal. Also, rice expands when water hits it. This can cause it to get stuck in the blades just like grease. Toss large amounts of food down the disposal all at once – Garbage disposals aren’t built to handle large amounts of food waste. For example, if you have a giant bowl filled with leftovers, either put a little down the disposal at a time while it is running, or simply toss the leftovers into the trash. Try to grind non-food items – Things like glass, cigarette butts, plastic and coffee grounds should never be put into a garbage disposal. 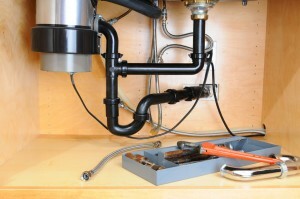 All of these things can damage the disposal and clog up the pipes leading away from it.